Toddlers are extremely active. We keep them actively learning. At Kiddie Academy,® we strongly believe in the formation of trusting bonds between toddlers and their teachers. Because of the tight-knit community we offer, our teachers will have a deeper understanding of your toddler’s personality. Our Discovering Me curriculum is designed to develop and reinforce each toddler’s individual needs, so children learn at their own pace. At Kiddie Academy, we understand that toddlers are very active. They are on the go and their natural curiosity prompts them to constantly explore. Our toddlers participate in sensory- based learning experiences while receiving positive, nurturing guidance from highly qualified teachers. 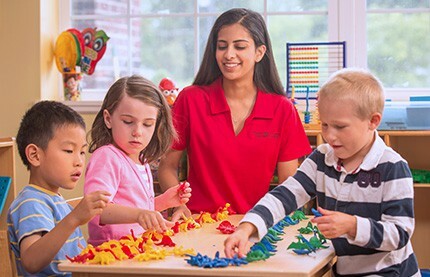 Our expert teachers guide toddlers while letting them lead the way and make their own choices. 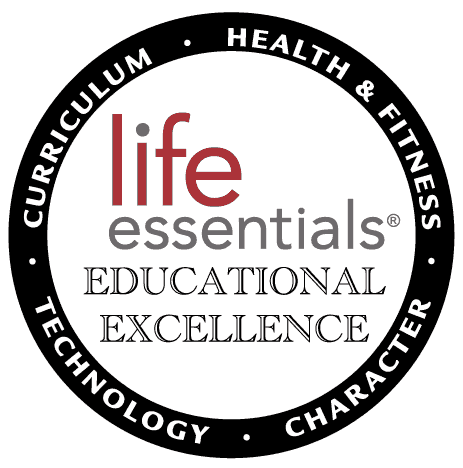 With Life Essentials, what your toddler learns throughout the day reinforces what she is being taught at home. 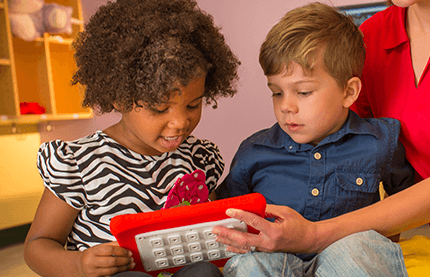 We acknowledge teachable moments as your toddler plays, helping your child learn all day long. 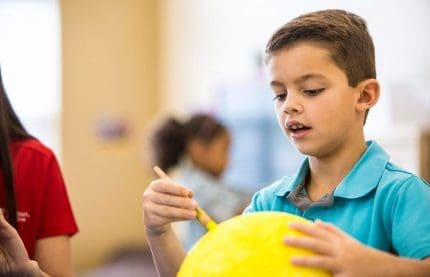 Our Discovering Me curriculum focuses on six areas of development: Cognitive, Communication, Emotional, Fine Motor, Gross Motor and Social Skills. 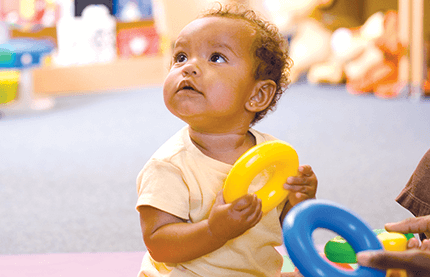 Cognitive Skills: Toddlers are learning new vocabulary, perfecting how they move through their environment and making connections with others. 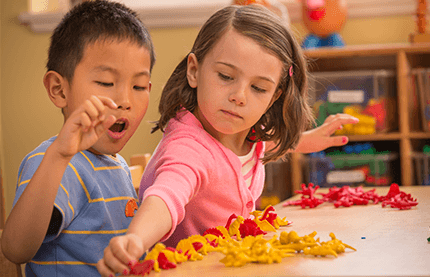 The Discovering Me curriculum focuses on establishing these connections through songs, finger plays, books and games. 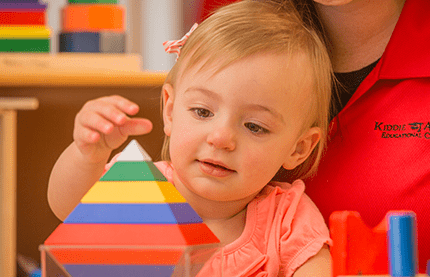 We give toddlers new experiences to build their imagination as we encourage them to name colors, objects and people. Communication Skills: Toddlers begin to use words to express their needs and to identify familiar people and objects. Kiddie Academy teachers work to improve your child’s vocabulary. When your child points to something, the teacher will name the item and ask your child to repeat it. Our teachers model good manners by saying “please” and “thank you,” and by welcoming guests into the room. They encourage your child to do the same. 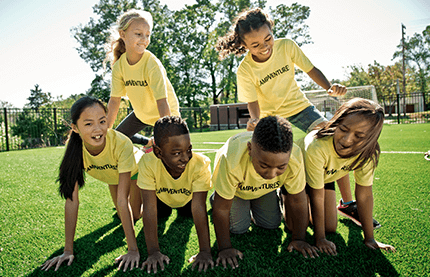 We take advantage of these teachable moments so your child doesn’t miss a second of fun and learning. Emotional Skills: Emotional development involves toddlers feeling safe in their environment. They will establish a strong bond with their teachers and experience a wide variety of emotions. Our teachers talk to your child about his or her feelings and what other people may be feeling. Fine Motor Skills: Fine motor skills are developed in the small muscle groups like those in our fingers and hands. 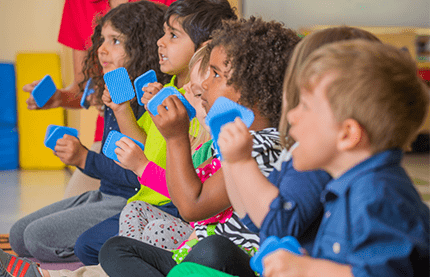 At Kiddie Academy, toddlers are encouraged to do things by themselves like washing their hands and using a fork and spoon to feed themselves. Toddlers have many opportunities to practice their skills throughout the day. Our teachers encourage them to work at their own speed so they feel successful in the skills they are developing. Gross Motor Skills: Gross motor development is the growth of the large muscle groups, like those in the legs and arms. Toddlers love to climb, so we provide them with safe climbing structures on our age-appropriate outdoor playground. Our older toddlers work on their throwing and catching skills, and enjoy making their way through obstacle courses that are set up in the classroom. Social Skills: Toddlers engage in longer periods of play, but still periodically check to make sure you are close by. They are not always ready to share toys and are very sensitive. At Kiddie Academy we developed social skills activities to help your child learn to share and respect others. 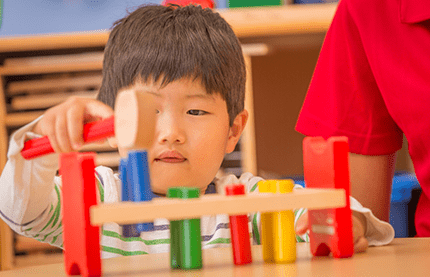 Your child will learn to take turns stacking blocks, assisting teachers and other children with clean up and playing follow the leader. 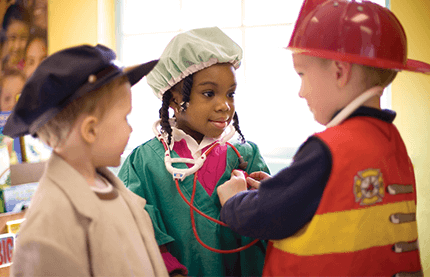 A toddler experiences STEM learning through exploration in the classroom and outdoors, by building a curiosity about the natural world and by learning about how things work. Toddlers will have opportunities to start comparing objects by size, practice beginning counting skills, explore building and constructing materials, and use their senses to observe and predict as they are experiencing the world around them.